This paper reviews the available literature on environmental thyroid disruptors or toxins, focusing on the scarce human data, but also including animal data to provide a perspective of the scale of the problem. It concludes with simple measures describ­ing how we can reduce our and our patients ' exposure to environmental endocrine clisruptor chemicals (EDCs). Normal thyroid volume of adult population depends on many factors and may vary in different geographic areas; there is a lack of data from India. Aim of this study was to assess distribution of normal thyroid volume (TV) and its determinants in iodine sufficient healthy females of Kerala. Study was conducted as a cross sectional house to house survey among the females above 35 years of age in a randomly selected urban area in Kerala State, India. Selected subjects were interviewed, examined and blood and urine tests were done. TV was calculated using portable US scan ma­chine. 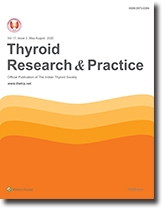 Among the 530 subject surveyed, 508 participated in the health checkup and from this 111 euthyroid iodine sufficient normal subjects were selected for further analysis. Mean age of the participants was 51.6 + 11.8 yrs and 53.2% were post­menopausal. The mean TV of these subjects was 8.8 + 3.1 ml (Right lobe 4.65 + 1.8 and left lobe 4.1 + 1.6ml; p = 0.005) andthe97thcentileofTVwas 15.3 ml. Age and postmenopausal status had negative correlation (p<0.001) with TV whereas weight, height, lean body mass, body surface area, triceps and subscapularis skinfold thick­ness representing body fat showed significant positive correlations with TV. But after correcting for age only triceps and subscapularis skinfold thickness were showing significant (P 0.02 & 0.005) positive correlations with TV. Conclusion: The distribu­tion of normal TV of iodine sufficient Indian females is described and age, postmeno­pausal status had negative while body fat had positive correlations with TV. Objective: Radioactive iodine-131 (RAI) has been established in the treatment of patients with various etiologies of hyperthyroidism. However the short term and long term clinical outcome of patients receiving RAI is different in various studies. The aim of this study was to assess clinical outcome one year after RAI therapy and identify factors associated with a good response. Methods: In this experimental study among patients with Graves'disease, multinodular goiter and toxic adenomas referred to the Nuclear Medicine Department and had indication for RAI therapy 164 subjects were selected randomly. Radioiodine dose was calculated on the basis of the size of the thyroid gland by physical examination. Patients with normal thyroid gland were given less than 10 mCi and if it was large or in the presence of thyroid nodularity a dose of greater than 10 mCi (approximately 15 mCi) was administered. Patients were monitored closely clinically and with blood investigations after treat­ment for one year. Results: Among 158 patients who completed follow up 98.8% recovered and 1.2 % remained thyrotoxic .Among patients who recovered 74.2% became hypothyroid and 22.6%> euthyroid. The incidence of hypothyroidism was 23 % in first trimester, 43.7% in second trimester, 4.4% in third trimester and 3.1% in forth trimester. Conclusion: In our study a good result was seen in more patients than other studies and it might relate to higher absorption of radioactive iodine in our region. According to our result incidence of hypothyroidism was the most in second trimester, so patients should be carefully followed in this period. We present a case of a 30 year old Kashmiri female with sudden onset bilateral lower extremity weakness who was found to have hyperthyroidism and severe os­teomalacia on further evaluation. Serum calcium, phosphorous, 24 hour urine cal­cium excretion and serum Vitamin D levels were low and alkaline phosphatase level was high. A diagnosis of hyperthyroidism with osteomalacia and myopathy was made. This demonstrates a rare case of osteomalacia and proximal myopathy as the initial presentation of Graves' disease and drastic improvement on treatment with anti-thyroid drugs and Vitamin D supplementation.